Left: Eva Stall Mats & Wall Protection. Right: Eva Breezeway Stall Matting. Trusted & established since 2004 - Sherprise Equine Flooring - distributor direct to you! Providing equine hygiene, thermal comfort and well-being with Sherprise quality flooring ranges PLUS savings by purchasing online distributor direct to you! Left: Wash Bay & Paddock Mats. Right: Interlock Recycled Rubber Pavers. 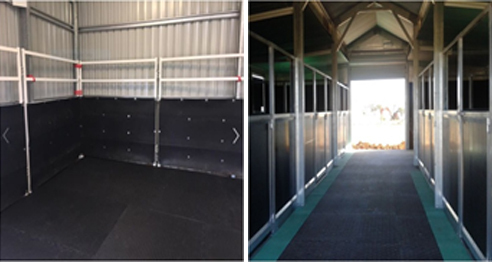 Stable stall comfortable Eva flooring for Breezeway Flooring, Paddock Outdoor, and Wash Bay Horse Mats. 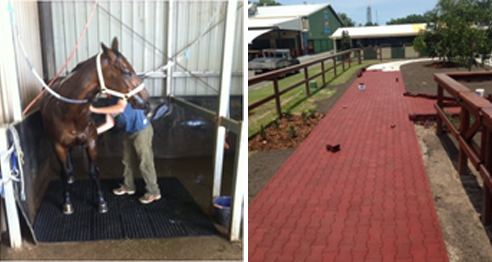 Stop mud with interlocking ground stabilisation drainage grid cells or interlocking rubber mats or recycled rubber pavers: please view our Equine Flooring Range at www.sherprise.com.au. Sherwood Enterprises is an established and trusted online, 100% Australian Owned and Operated, Equine Flooring Distributor based at Redland Bay QLD, transporting horse flooring throughout Australia. Why put up with unhealthy mud! Install ground stabilisation drainage grid cells! Please note: with every purchase you also assist other Australian small business and their families who assist us day in day out, to market and deliver our quality equine ranges. So, thank you! All ranges we stock and market are eco-friendly, 100% recyclable, and internationally ISO 9001 Certified. Showroom: Unit 9/12 Daintree Drive, Redland Bay QLD 4165 - Monday to Friday by appointment. I would like to enquire about Sherwood Enterprises.